Like so many other neighborhoods across Japan in July, Konda, in Tsukuba City holds a summer festival ( NATSU MATSURI). 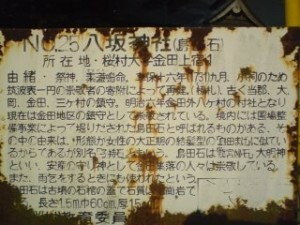 Unlike Japan`s spring and autumn festivals, which are usually agriculture related and traditionally carried out with the aim of helping to ensure ( with divine assistance) good harvests, summer festivals have been held in the belief that they prevent epidemics, natural disasters and even summer lethergy. They also often involve prayers for rain. 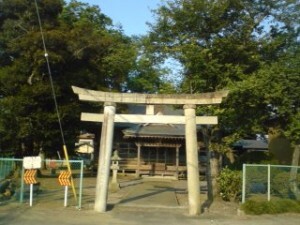 It is typical for these summer festivals to be centered around a type of shrine now most commonly referred to as Yasaka Jinja ( 八坂神社) in which the God Gozu-Tenno ( who came to Japan from India via Korea) and the popular God of Japanese mythology, Susano no Mikoto, are enshrined ( now intermingled as one). The reason for this is that both of these deities are believed to be associated with disease prevention. Since the year 869, when the first Gion Matsuri was held in Kyoto with the aim of driving away an epidemic which had been raging, these shrines ( formerly Gion-Sha, now Yasaka Jinja) have spread throughout Japan ( there are approximately 3,000 of them, with dozens right here in Tsukuba), and of course still enshrine the spirits of the disease preventing deities Gozu-Tenno and Susanoo-no Mikoto. And, just as in Kyoto more than a millenium ago, these shrines still hold their NATSU MATURI ( in these cases Gion Matsuri, Gion-Sai or Tenno Matsuri) in July, with the aim of keeping their neighborhoods healthy during Japan`s brutal summers. Since the summer festival in my old neighborhood of Konda (金田) is a Gion Matsuri type festival AND will be held THIS WEEKEND, I figured I`d go over to the Yasaka Shrine there, have a long, close look, and try to get into the right frame of mind for the upcoming festivities. Standing just outside the torii gate ( which one Shinto priest once told me was a gate to the sacred which was always open) and looking in at the shrine and its grounds, things did not look very impressive. Neither imposing nor beautiful, nor even rustic, it seemed to lack the charm that I so often feel when visiting a shrine. 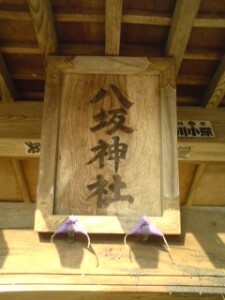 The sign then goes on to explain that the Shimada Ishi Stone, of local legend, can be found on the grounds of the shrine, and I saw it just to my left as I passed under the Torii gate. This stone, which is quite famous in my neighborhood, was probably once the lid of an ancient tomb. Later, it was believed to help women concieve and then safely bear children. Some families still have chips of the rock on their Shinto altars ( Kami Dana), having been placed their originally generations ago by mothers who had successfully given birth. I have heard that this hour-glass shaped stone was later used for rain supplication rites, in particular during the Great Tenmei Famine (1782). 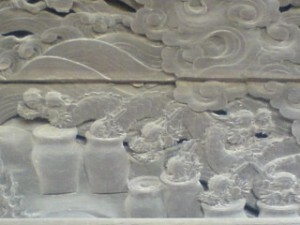 It is said that fires were lit on top of the stone in the hopthat the smoke would form, or summon rain-clouds. A famous local legend tell how a dragon appeared in the smoke which rose out of the fire on the stone , which then headed towards Mt Tsukuba. It soon started to pour. There was a price to pay for this success, however, according to the story: the stone would no longer help women have children. Eventually the stone was laid within the precencts of the Yasaka Shrine ( which by the way, the locals affectionately call Tenno-Sama). 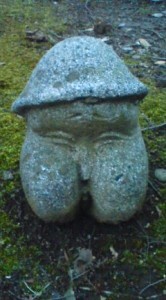 An unusual sacred stone combining the male and female organs to form a human head! 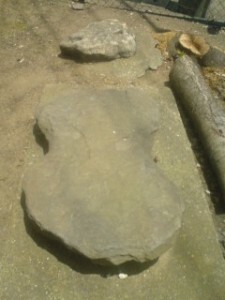 There are some other unusual stones laying about on the perimeter of this shrine. Many seem to have been used ( probably in pre-historic times) to make fires. Continuing to explore I admired the beautiful old trees, probably about 300 years old, all gnarled and hollowed out. The shrines buildings, however, just did not seem very interesting at first. 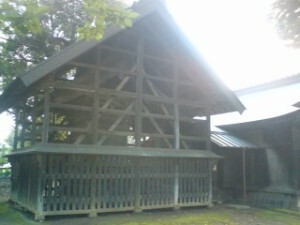 I then noticed that in the back of the shrine, the large and boring structure was merely a protective cover for a much older and much more spectacualr structure. peeking through the planks I found fantastically elaborate carvings- better work than most shrine carvingsI have seen in this part of Japan. There were imaginary beasts and other, apparently non-figurative designs. On the back wall I came across a complex scene, but it was difficult to make out exactly what it was. I quickly sensed,however, that it was something special! 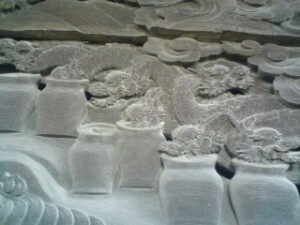 Letting my eyes adjust to to dark and trying to find the best space with the best angle to look through, I finally made out the forms of what appeared to be- DRAGONS DRINKING FROM JARS! Then it hit me! I knew what the scene was! One of the more famous episodes from Japan`s oldest extant written text The Kojiki ( early 8th century), and one which involved none other that Susanoo-no Mikoto, who of course was enshrined in that building. 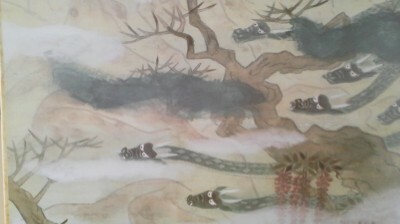 The panel depicted the story of the YAMATA NO OROCHI (八岐の大蛇) ! Let me tell it to you in brief ( if you dont already know it). 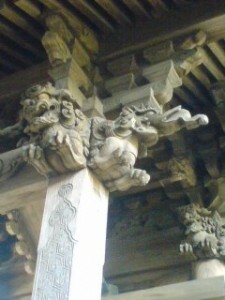 Susanoo was expelled from the realm of the Gods and descended to earth at Izumo ( now in Shimane prefecture). He saw a pair of chopsticks floating down the river and realized that there must be people around. Searching for them he came upon an 3 people, an old couple and their daughter. They were highly distressed and needed help. That is because an eight-tailed and eight headed dragon which had killed their other daughters was coming back again for another of their daughters. After having gained a promise of the daugher hand in marriage, Susanoo-no-Mikoto agreed to slay the monster- the Yamata no Orochi. He order that sake ( rice wine) be brewed and then poured into into eight jugs. These would then be placed on 8 platforms, each with a gate built around it. When the monster came, it drank simultaneously from each jug, with its eight heads.After becoming intoxicated the beast fell asleep, and was easilly slain by Susanoo-no-Mikoto. 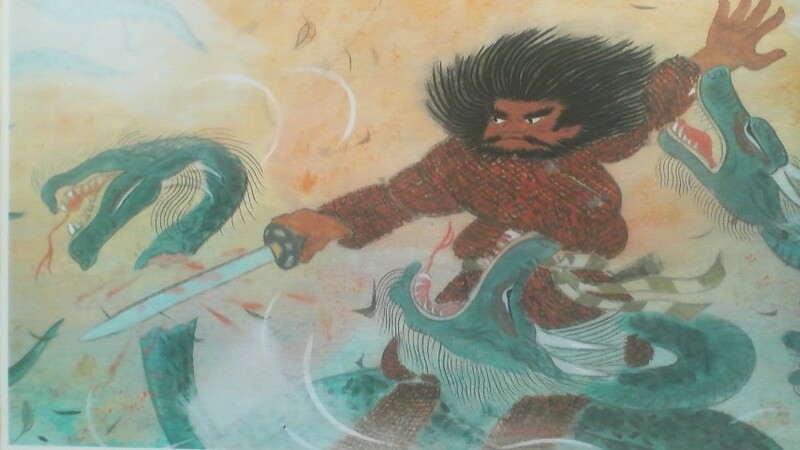 From the Yamata no Orochi`s body, Susanoo pulled out an extraordinary sword, which later it is said became one of the three-treasures of the Japanese Imperial Family. 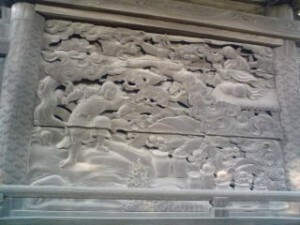 Looking closely at the carvings, I found them to be a sublime depiction of the story, hewn into the wood. Trying to get my arms through the spaces between the planks to take pictures with my cell phone, made me feel a bit like the Yamata no Orochi, with its heads put into the tight gates. 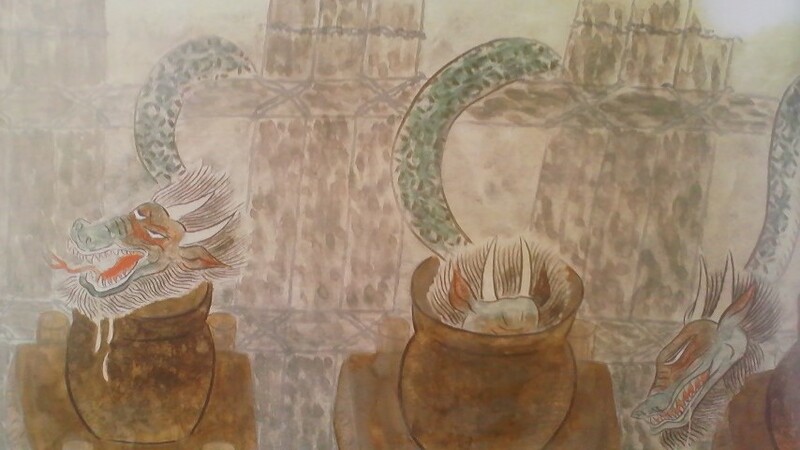 Because the shrines most beatiful aspect was hidden away, I was also reminded of the Edo Period`s famous aesthetic of cool, known as IKI ( which actually had its adherents until the Second World War). According to it precipts, beauty should be HIDDEN AWAY. For example it was usual for the LININGS of coats to be very extravagant, or to have fine carving or paintings in places where they could not easilly be seen. 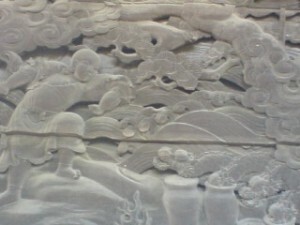 These carvings, so beautiful, elaborate, and HIDDEN AWAY are truly IKI! and will try to let more people know about the existence of these works. In the meantime, dont forget that the festival will be this Saturday and Sunday. Japan`s Mid-Summer Gifts: O-Chugen – Why they are given, and why you might want to give them, too!